New York-based Priority Bicycles announces the launch of its second Kickstarter campaign to fund its newest bicycle concept, the Priority Start. The latest development offers a simple and safe learn-to-ride solution for children and a virtually maintenance-free bicycle that will last for generations to come. After launching its first round of bikes and surpassing a funding goal 18 times over in its initial Kickstarter campaign in July 2014 delivering to all backers on and before the goal date, Priority Bicycles took its innovative and simple approach to bicycle design and re-imagined it for the kid’s market. 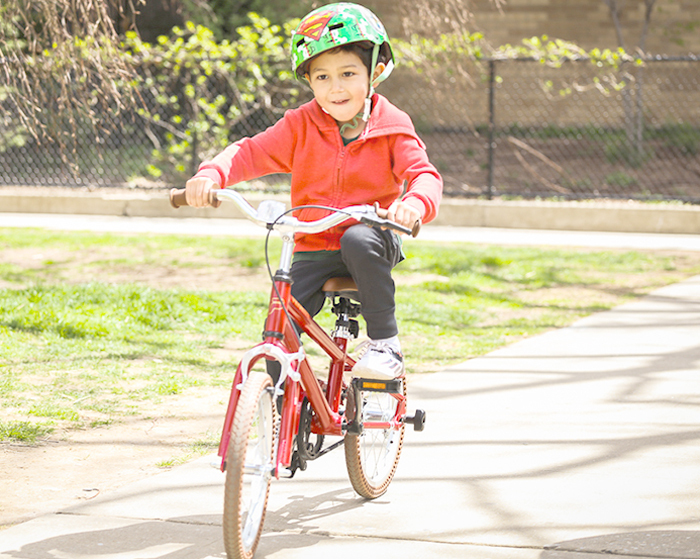 The Priority Start is designed for kids ages 2-8 and addresses many challenges that current children’s bike offerings face. Available in 12” and 16” models, the bicycle features Priority’s signature belt drive in place of a standard chain, which has never been offered in a kid’s bike and requires virtually no maintenance and a grease-free alternative to parents and children who often find themselves with messy hands and clothes after riding. The Priority Start is classically styled in a rustproof aluminum frame for easy transport, and durability to combat weather and outside storage. The bicycle also comes with air-free Easy Go tires that never go flat and are equipped with air holes to help absorb bumps; a feature that remedies the difficulty of learning to ride on under-inflated tires or a bike not being ready to ride at a moments notice. In addition, the children’s bicycle also features the innovative patent pending Priority Start System training wheels developed to deliver a solution to many existing systems in the market that are overly complicated, challenging to adjust, and demand technical knowledge and tools. The Priority Start System features a simple 3-2-1 system: Level three offers the most riding support with the training wheels just off the ground, level two raises the wheels slightly higher to teach introductory balance, and level one raises the wheels even higher to allow the child to balance freely with backup safety in case they lose balance. Unlike other training wheels, the simplified system features a hand knob to affix, adjust and remove the training wheels without the need for tools - great for learning at the park or on the go. Currently in the final stages of development, the Priority Start debuted on Kickstarter today to raise funding for the molds and tooling to begin mass production. For information on the Priority Start, please visit the Kickstarter page at prioritybicycles.com/start or contact Priority directly at info@prioritybicycles.com or (917) 819-1665.